Avinash and Chetan live in different domains, while one is an ambitious marketing professional; another is a hard-core spy out to serve his country. Avinash is struggling to retain the new job he has joined. Chetan has recently shifted from Colombo to Ahmedabad, as station head of R & AW. Destiny bring them together when Tamanna, the love interest of Avinash, leads him to an unthinkable terrorist plot emanating from a Pakistan based Jihadi group.The Story moves across the Indian subcontinent , from Pakistan to Bangladesh and Nepal to Sri lanka uncovering a deadly terrorist plot which can put Indian union in danger. It has to be seen if Chetan is able to stop the terrorists before they strike and if Avinash is vindicated in his trust in Tamanna. The first word that comes to my mind after reading this book is “Commendable!” For a debut novel it is very well researched and written with a very gripping narrative. The author deserves applause for the same. The book, as the blurb says it about two people coming from completely different backgrounds – one is a spy who works for RAW while the other is a simple common man trying to make a life out of the chaos he is surrounded with. Enter a girl called Tamanna and things change; for good or bad is something that the reader has to find out from the book. Making your protagonist a RAW agent is no mean feat and for this the author should take a bow! He has not only read books on RAW but has also personally met some station heads and RAW agents discussing this book just to ensure the authenticity of the same. And to a very large extent he has been successful I must say. Through his simplistic language skills he has managed to weave a very complex cobweb of lies, deceit, love and patriotism. I somehow feel this book lacked proper marketing which a book of this kind truly deserves to reach one and all for its powerful story line. I would recommend this book to people who enjoy reading thrillers and such action genres purely for the strong story line and plot backed by exhaustive research. 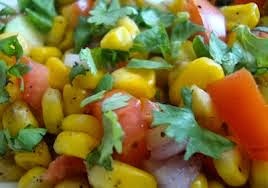 This book is like corn chaat - tasty, crunchy, spicy, salty and mouth watering!